The Albert Schweitzer Haus is a Lutheran dormitory and cultural as well as religious venue in the 9th district of Vienna, the Alsergrund. 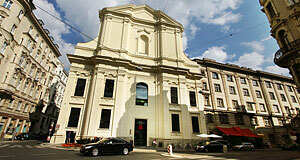 Its front side tell a lot about its history: The modern building incorporates the façade of a Baroque church. It was the church of the "Schwarzspanier", meaning "Black Spandiards". This term relates to Benedictine monks of the reformed community of Montserrat in Spain - who wore the black clothing of the Benedictines. The first Schwarzspanierkirche of Vienna on this very site had been destroyed in the course of the Second Siege of Vienna in 1683. In 1690, the Schwarzspanier started to build a new church in Baroque style. It took a long time for the church to be finished: The opening ceremony was conducted by the Archbishop of Vienna, Count Sigismund of Kollonitsch, in September of 1739. Things went downhill soon after the opening: In 1749, the bell tower was opened, but six years later, a lighting damaged it so badly that it had to be dismantled again. In 1780, the Schwarzspanier monks moved to a new building within the city walls of Vienna (at least they have learned their lesson from the siege and lighting and looked for a safer shelter). Following the move, the Schwarzspanierkirche church was given to the Royal and Imperial Army as a military church. Nearby, the military had extensive barracks, the Alser Kaserne. As one of the first changes, the frescoes of the church were painted over in 1780. In the course of the next seven years, all of the interiors were sold. Including the beautifully crafted benches, which you can now see inside the Augustinerkirche at the Hofburg - the Augustinian monks bought them through the Dorotheum auctioneer, soon before they were dissolved themselves (and later re-established in Vienna; back to the battered Schwarzspanierkirche, though). In 1787, the church was finally "profanised" - the proper term for "church being de-churchinised". From 1787 until 1861, the Schwarzspanierkirche served as a warehouse and storage house for military beds. In 1861, things changed for the good - at least temporarily. The church was given to the Lutheran community among the soldiers in Vienna and colloquially called "Garnisonskirche". It gained a new altar and organ, new chairs and a pulpit. After the end of WWI, there was no need for a Lutheran military church in Vienna and the Garnisonskirche nee Schwarzspanierkirche was closed until 1930. Then it was used for Orthodox services until the Anschluss in 1938. The Nazis had ambitious plans with "The church formerly known as Schwarzspanierkirche": They wanted to give it to the Lutheran community within the Wehrmacht. The frescos (those that were painted over in 1780) were re-discovered and uncovered in 1939. The Archdiocese of Vienna donated a new altar painting by Joachim von Sandrart. Things finally went well for the Schwarzspanierkirche and in May 1943, it was officially re-opened. One year later, bombs hit the Schwarzspanierkirche and damaged it so seriously, that it could not be repaired. The ruins remained unchanged for a long time. All of the ruins except for the façade of the main entrance area were demolished in 1963. The Lutheran community of Vienna built a new dormitory, the Albert Schweitzer Haus - opened in 1966. Recently, the entire building was extensively modernised and today, the Albert Schweitzer Haus is a modern conference centre, site for religious encounters and residential house for students. In the ground floor, there is a fancy café. Attractions nearby are numerous. The closest ones are the Votivkirche, the Josephinum, the Sigmund Freud Museum in Berggasse, the Altes AKH with the Narrenturm, the Allgemeines Krankenhaus AKH, and the Austrian National Bank. Note also the main University, the Börse Stock Exchange and the Rossauer Kaserne.